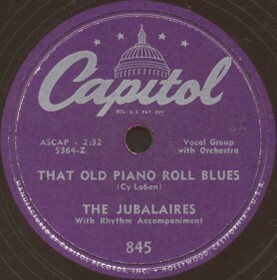 "That Old Piano Roll Blues"
Above: Photo of The Jubalaires. 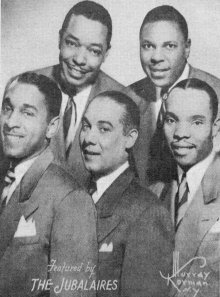 (Top L-R) Caleb Ginyard, George McFadden, (Bottom L-R) Orville Brooks, Everett Barksdale (guitarist) and Ted Brooks. 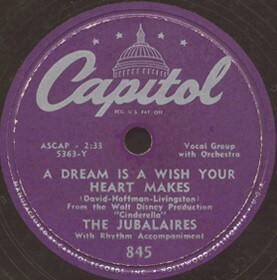 Above: This is The Jubalaires' third release of seven on the Capitol label between 1949 and 1951. In addition, they had backed up Johnny Smith on two earlier Capitols. They also had releases on Decca in 1944/1950, King/Queen (as The Jubilaires) in 1947/1950 and on Crown (as by The Original Jubalaires) in the early 1950's. Click on an option below to listen to "A Dream Is A Wish Your Heart Makes" using RealPlayer. Click on an option below to listen to "That Old Piano Roll Blues" using RealPlayer.